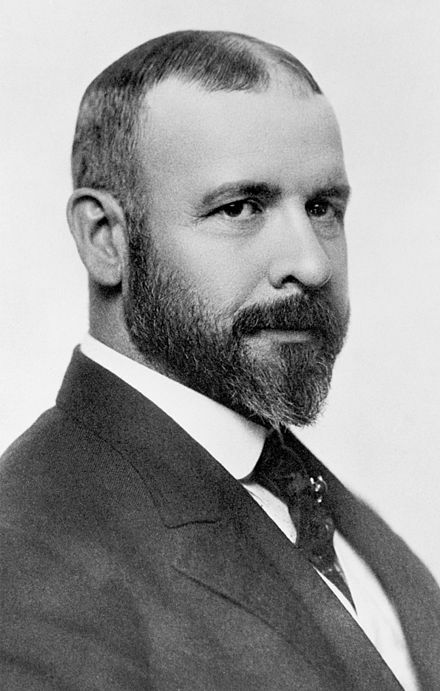 Louis Sullivan enjoyed quite an extraordinary life, and both his architecture and his ideas about architecture have been immensely influential. After all, he helped create that amazing Chicago skyline. He must have been quite a character as well, here he writes about himself in the third person, writes expansively and exultantly with great gestures of his arms and a boundless enthusiasm for his subject and belief in his own talents. THIS IS THE PLACE FOR ME! That gives you a good sense of the flow and nature of his book. He describes Chicago as the Garden City — as it was before the great fire and its rebuilding. 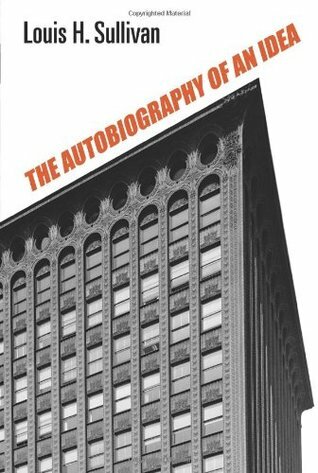 In a way this really is an autobiography of THE IDEA…it is deeply personal in some of the childhood memories, vivid memories of feelings and events and people that shaped him and moved him closer to his understanding of man’s place in the world, and based on that, the role of architecture. There is nothing included here that does not move him closer — and perhaps nothing is more indicative of how he arrived at this idea and what it meant than the fact that it was not wife, children or friends that helped him arrive at it, only key family members from his childhood, teachers and a handful of work colleagues. It’s all quite gloriously overblown, isn’t it? It captures the sense of this age poised on the edge of a new time of plenty but still well aware down to its bones as it emerges from a depression of the farm, the hard work, the difficult life where survival must be fought for. Louis Sullivan himself goes on to list mankind’s primary powers: the worker, the inquirer, the chooser. But these are tied into his senses, his ability to take information in and to learn and grow and observe, and then to apply imagination and will. In that it is vaguely reminiscent of Holmgren’s permaculture principal actually, this book shows a very keen eye for observation and detail abounding in nature and the desire to draw from those the designs for buildings that shape our lives. And his dream of a solution? Our dream shall be of a civilization, a social fabric squarely resting on man’s quality of virtue as a human being; created by man, the real, in the image of his fruitful powers of beneficience; created in the likeness of his aspirant emotions, in response to the power and glory of his true imagination, the power of his intelligence, his ability to inquire, to do, to make new situations befitting his needs. Everything here I rather love — though perhaps it is more nostalgia I feel towards an age where everything, including hope, looked possible. I love everything except the reference to race. It crops up a number of times in this rather messianic way. Makes me sad to be almost entirely certain he is meaning the white race when he uses that word, and the implications, well, I hate the implications. His partner was a Jew (as he notes), so at least he was including them in his vision. And maybe I am doing him a great disservice, I will reserve judgment. For us the chief impress of the self-revealing story of mankind lies in the perception that all sanctioning power comes from below. From the vast human plenum we have called the multitudes, it arises gently, massively, step by step, stage by stage, height upon height…The spectacular and imposing groups and summits of the feudal superstructure have no other base, no other sanction. That is the noble dream people still cling to I think. Yet this age was one of Indian wars, Arizona and much of the west were still only territories, the Monroe Doctrine had been in place for fifty years…it wasn’t innocent at all, but reading this you have to keep reminding yourself of that. 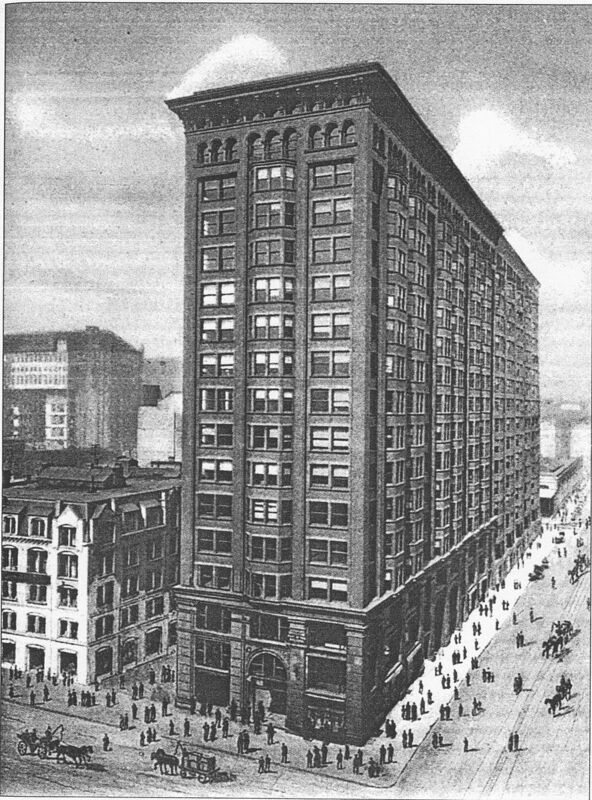 Monandock Building, Chicago, seen from VanBuren Street. I loved finding his views on the Mondanock, by Burnham & Root — the model for the skyscraper of Henry Fuller’s novel The Cliff-dwellers. This was about as high as masonry could go. I’m so looking forward to seeing it. As we go back to a world closer tied to the soil through energy descent, we’d do well to remember this and avoid it if possible. the other curious aside was about the Irish — Louis Sullivan’s father obviously was Irish but his mother and the grandparents who played a great role in raising him were Swiss. That made me a bit sad, but this was the age of anti-Irish sentiment. Such a dream is the vigorous daylight dream of man’s abounding power, that he may establish in beauty and in joy, on the earth, a dwelling place devoid of fear.